Exotron followed the release I.D. and the pair were about robots with human personalities uploaded in them. I'm sure that was nothing but a coincidence but did we really need two? But if its a choice between Exotron and I.D. then Exotron wins hands down. And not just because one of my favourite companions, Peri, is in it. 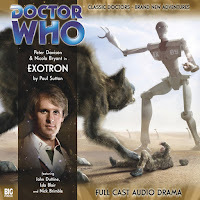 Exotron is a much more interesting audio play, while it isn't stellar, you can guess what is going on before the end of the first episode and the idea of giant hyenas fighting transformers doesn't really translate itself to the audio medium all that well. The story takes place on a distant colonial planet of Earth and small group of terraformers find themselves under threat from the planet's fearsome predator, the carnivorous Farakosh. It is only the robotic Exotrons who stand between the colonists and a grisly death. The carry huge and deadly weapons designed by Major Taylor. As usual, all is not as it seems. Just how are the Exotrons controlled? And where have the colonists found the materials to build them? The Doctor and Peri are on the hunt for answers and Major Taylor is reluctant to give them. This story is diverting enough and I managed to get the whole way through it without yawning, which is good! And the plot chugs along nicely, author Paul Sutton gives us some nice visuals. The acting is also reasonable across the board and the Doctor is well written, even if Peri suffers somewhat from poor material. It is a shame then that it is just all a little bit silly. 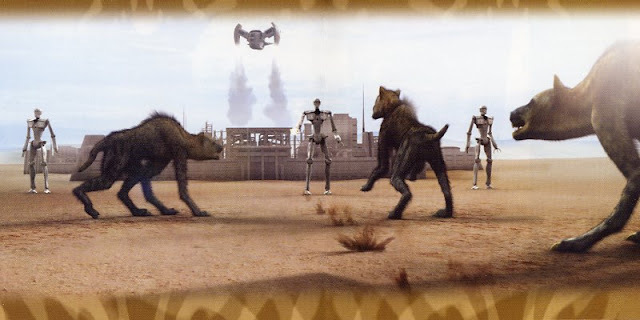 I'm sorry to people who love this release but it is, giant hyenas and transformers?! It is fun but silly. Its nothing remarkable but it certainly isn't offensive. This story is also paired with a one part episode called, Urban Myths. Urban Myths is an interesting little bit fluff which doesn't really have any import. Really all it is, is an excuse for Peter Davison and Nicola Bryant to play different versions of their characters. A group of assembled Time-Lord assassins remember with less than perfect memories the events that caused them to believe that the Doctor needed to be killed. As the story moves on, events become more clear but it is evident from the outset what is happening, so there aren't any huge surprises. But it entertaining and good for a laugh, especially Nicola Bryant's deep voiced-evil Peri.